One of the greatest joys in life is being a dog parent. But, being a dog parent comes with great responsibility! Dogs are prone to health issues just like humans, so pet parents need to know what to look out for and how to respond. We want to highlight the most common Shih Tzu dog health problems you need to know about. Shih Tzu are a brachycephalic dog breed. This means that they have shorter snouts and flatter faces than other breeds of dog. The flattened shape of the face is known to cause some issues, such as snoring, snorting, and overheating. Since the brachycephalic dogs do not have as much room in their face as dogs with large snouts, they can develop deformed and under-developed airways. Difficulty breathing. Brachycephalic dogs may have trouble taking in the proper amounts of oxygen. This can cause them to tire quickly after heavy activity, or can even be a problem when they are not active. Overheating. Dogs regulate their body temperature through panting. Their ideal body temperature is between 100 and 102 degrees Fahrenheit. When they cannot breathe properly, they cannot regulate temperature efficiently. Because of this, these breeds cannot handle hot weather as well as humans or other dog breeds. Some cases of overheating have even lead to death. Heart problems. The inability to take in the proper amount of oxygen can lead to heart problems as the bloodstream is oxygen-deficient. Your dog’s resting pulse should be between 70 to 130 beats per minute. With less oxygen, this rate increases putting more strain on the heart and leading to heart problems. Narrow nostrils. Undeveloped airways can be seen on the surface level if the nostrils are narrow or tight. Also, when your dog breaths, you may hear wheezing or whistling if the nostrils are too narrow. Narrow airway. A narrow airway is hard to identify visually, but you may detect it by auditory cues. If your dog regularly makes snoring noises or coughs a lot when breathing, then he may have a narrow airway. Soft palate. Underdeveloped and deformed airways can cause your dog to have a soft palate, leading to breathing problems. As with narrow airways, this is hard to identify by sight, but you will hear your dog making snorting and grunting sounds when breathing. If your dog is displaying any of these symptoms, please take him to a veterinarian. These issues cannot be treated at home and generally require surgery. Your dog’s vet will perform an examination and determine whether your dog’s condition is severe enough to require surgery. Since surgery carries its own risks, your dog’s vet is likely to recommend surgery only if they believe it is the best option for improving your dog’s life. TIP: If you're thinking about health insurance for your Shih Tzu you may want to get it sooner rather than later. The older your dog is, the higher the premiums. Following these simple steps does not reverse any under-developed or deformed airways, but it does help your dog cope with breathing difficulties! Your little fur-buddy will be grateful for your effort! Shih Tzu and some other dog breeds have large eyes set in shallow sockets. This position leaves eyes more exposed and prone to injury. Because the risk of eye injury is greater in these breeds, dog owners should be aware of these eight common types of eye problems in dogs. Dry eye. Dry eye, known technically as Keratoconjunctivitis sicca (say that five times fast! ), is due to insufficient tear production in the eye. When this occurs, dogs are at risk for infection, corneal ulceration, and vision loss. Since Shih Tzu are prone to dry eye, they should be examined regularly by their vet. If the vet diagnoses your dog with dry eye, he or she can recommend or prescribe eye drops to be given daily. Corneal Ulcers. Corneal Ulcers are injuries caused by irritations to the eye. These irritations are the result of abnormally grown eyelashes, injury, and trauma, such as abrasion, scratches, or punctures. These ulcers appear as a dot on the dark part of your dog’s eyes. The whites of his eyes become red from irritation. You may notice your dog squinting a lot if he has corneal ulcers. It’s important to address this issue quickly because corneal ulcers are uncomfortable and sometimes painful for your dog. Corneal ulcers are generally treated with anti-bacterial drops or ointment. Max used to get corneal ulcers frequently. His vet would smooth out the ulcer with a long cotton swab. This might sound uncomfortable, but Max is laid back and was a good patient! This treatment helped the reduce the ulcer, but the ulcers would keep coming back, so the vet prescribed an integrative eye drop. Since using this treatment, Max has not had another ulcer for years! Proptosis. Proptosis occurs when the eyelids close or fold behind the eyeballs. You will notice the eye protruding or that your dog cannot close his eye (lagophthalmos). Besides discomfort, this is a problem because it blocks blood flow to the eyes. 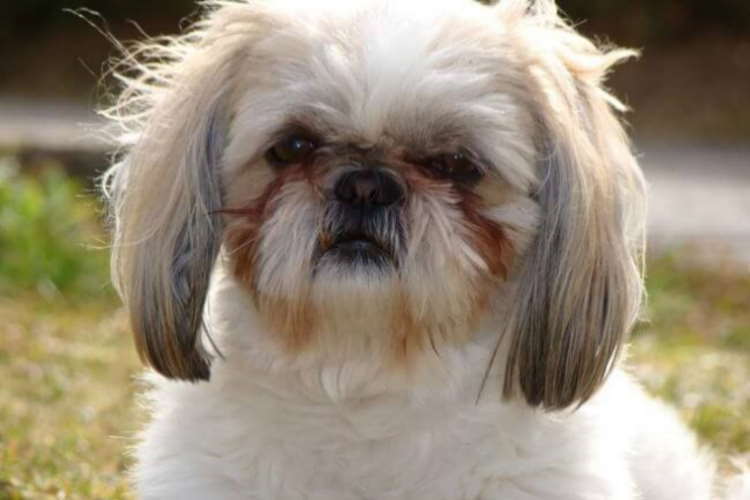 Since proptosis is generally caused by trauma from fighting or playing rough, Shih Tzu and other breeds with protruding eyes need to be careful when playing with other dogs. If you notice your dog’s eyelids are behind his eyes, you need to seek medical attention immediately! Your vet will sedate him and perform a minor procedure to reposition the eye and eyelids. Antibiotics are also usually administered to prevent infection. Lagophthalmos. Another hard one to say! Lagophthalmos is the condition that inhibits your dog from closing his eyelids all the way. You’re likely to notice this when your dog is sleeping, but his eyes are still partially open. Lagophthalmos can lead to dry eyes or corneal scratching. This condition is not an emergency, but you should have it examined at your dog’s next vet visit. Retinal detachment. The retina is one of the innermost sections of the eyeball and is largely responsible for clear vision. Your dog’s retina can become detached due to severe trauma, glaucoma, or high blood pressure, but it is most common caused by age. Retinal detachment leads to vision loss and blindness. If you notice your dog is experiencing difficulty with his vision, he may have a detached retina and you should seek medical attention immediately. Depending on the severity of your dog’s condition, he may need surgery to reattach the retina. In some cases, retinal tissue can be regrown with non-surgical procedures. If the condition is too severe to be reversed, then your vet will teach you how to help your pet cope with his handicap. Pain medications can also be prescribed in cases where detachment is caused by glaucoma. Cataracts. Cataracts obstruct light from entering the retina of the eye, which impairs your dog’s vision. Cataracts are easy to spot as they are large, thick, cloudy spots on the eyeball. Cataracts are generally caused by old age, but can also be the result of diabetes, inflammation, or trauma from electric shock. If you see that your dog’s eyes are cloudy, you should take him to his vet immediately because cataracts can grow worse and lead to blindness. Most often, your dog’s vet will perform surgery to remove the cataract, but there is a non-invasive procedure known as phacoemulsification. If your dog’s condition is right for this procedure, his vet may opt for it instead of surgery! Distichiasis and ectopic cilia. Featuring yet another difficult name, this health condition is the growth of eyelashes or hair from the coat inward or out of position toward the eye. When this happens, eyes can become scratched or damaged. The most common symptoms of distichiasis and ectopic cilia are excessive tears and tear stains along the eye. If your dog is displaying these signs, you should take him to his vet for treatment. Depending on the type of distichiasis and ectopic cilia, your dog’s vet may freeze out the offending hair follicles or may have to surgically remove eyelashes or hair follicles. Eyelid protrusion. Also known as cherry eye, this is the term for a large red lump in a dog’s eye. This lump develops when a tear gland becomes loose and bulges out from the eyelid. If you’ve ever seen someone flip their eyelids and show the red underneath, this condition may remind you of that! If you discover a large red lump in the corner of your dog’s eye, you should take him to his vet. Your vet will surgically replace the gland or remove it entirely depending on the severity of the condition. Progressive retinal atrophy (PRA). PRA is not common in Shih Tzu, but it can be inherited. PRA is the degeneration of cells in the retina causing vision loss and blindness. Dogs with PRA appear to have glowing pupils and tend to suffer night blindness before further vision loss. Sadly, this condition is not curable, but some veterinary ophthalmologists are studying the effects of antioxidants on prevention of PRA. As mentioned before, Shih Tzus are a brachycephalic breed of dogs, meaning the shapes of their faces are different than other breeds with long snouts. Brachycephalic dogs are prone to some dental problems, mainly small mouth-related issues and underbite. Small mouth. 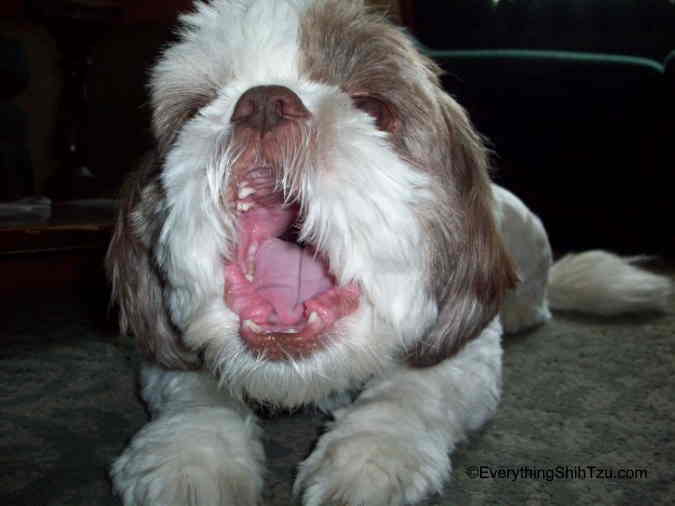 Because Shih Tzu and other brachycephalic dogs have small mouths, their teeth tend to be crowded. This results in crooked teeth, tooth decay, gum disease, and tooth loss. Unfortunately, you cannot control how your dog’s teeth grow, but you can help promote healthy teeth and gums by brushing your dog’s teeth, giving him dental chews, and feeding him good dog food. If the condition of your dog’s teeth is severe, his vet may perform professional cleaning or remove problematic teeth. Underbite. As with humans, an underbite in your dog refers to the protrusion of the lower jaw beyond the upper one. An underbite is not always a problem, but it can be a source of pain in dogs. If your dog has an underbite that is painful, you will notice your dog recoils when you come near his face, he rubs his head on the wall or with his paws, or he has difficulty eating. If you think your dog has an underbite that is painful or causing problems, have his vet take a look. He or she may perform some tooth extractions to allow the remaining teeth to rearrange in a comfortable position for your dog. Shih Tzus are can develop some ear problems, which cause hearing loss and pain. Hearing problems can be the result of infection or mites and parasites. If your dog is experiencing hearing problems, you may notice that he frequently shakes his head or scratches and rubs his ears. In some cases, you may notice a foul smell or dark discharge when cleaning the ears. When you notice your dog behaving this way or exhibiting foul smells or discharge from his ears, you should take him to visit his vet. Usually, the vet can treat the condition with some cleaning and ear drops. When Max and Rufus first joined us in our home, both of them had mites in their ears. Their vet discovered this condition and was quick to clean it up, but Rufus continued to have problems. If you came near his ears, Rufus would recoil and snap. We took him back to the vet, where they discovered his condition was so severe that he had to be muzzled to prevent him from snapping at the vet during his examination. It turned out that his ears were badly infected. The vet was able to treat this condition, and now Rufus lets us rub and clean his ears without raising a fuss. Ever since then, we make sure he gets his ears checked and cleaned by his vet on every visit! Shih Tzus and other breeds are prone to some joint and back problems. These issues can have a heavy impact on your dog’s quality of life, so knowing which signs and symptoms to look for can help your furry best friend be a happy doggo! Luxating Patellas. These are also known as slipping kneecaps. In small dogs, such as Shih Tzu, the kneecaps can pop out of place and cause discomfort or pain. Both Max and Rufus have experienced luxating patellas. Occasionally they will hop around with a leg up until the knee pops back into place. Usually, this is all a dog needs to do to correct displaced kneecaps. Resting and stretching can also help the knee move back into place. In severe cases, surgery is may be required. Fortunately, Max and Rufus have never had luxating patellas this severe! One way to help prevent severe luxating patellas is to discourage your dog from jumping off furniture or other high points that can impact their joints. For our dogs, the furniture is arranged in a way where they can hop down without impacting their joints too much. If arranging furniture isn't an option, there are pet steps or a ramp, which could help. Hip dysplasia. Hip dysplasia is a degenerative condition in which the hip bone does not sit correctly in the hip socket. This is common in Shih Tzu and all dog breeds as they age. Hip Dysplasia causes pain and can lead to arthritis. If your dog has hip dysplasia, you may notice a decrease in activity, decrease in range of motion, difficulty moving, stiffness, pain, and loss of muscle mass. If you see your dog experiencing any of these problems, bring him to his vet for an examination and diagnosis. For treatment of hip dysplasia, there are non-invasive and surgical treatments. Depending on the severity of the condition, the solution may be as simple as dieting, physical therapy, or anti-inflammatory medicine. In more severe cases, surgery may be necessary. Spinal disk ruptures. This sounds intense and, fortunately, it is not too common. When a disk slips or ruptures, it can cause pain, nerve damage, and even paralysis. Spinal disk ruptures may occur when your dog jumps from a very high place or experiences traumatic injury. If you notice your dog refuses to jump, has pain in his back legs, cries out in pain, and is hunched and tense, he may have a ruptured disk. Treating a ruptured disk depends on the severity of the condition. Treatment may be surgical in severe cases, but in more mild cases, anti-inflammatory medicine, steroids, and rest may be all that are necessary. A common kidney problem that Shih Tzu can experience is renal dysplasia. Not all Shih Tzu experience this condition, but it is noted as common in this breed. If you observe any of these symptoms in your dog, take him to his vet for a diagnosis. If your vet determines that renal dysplasia is the cause of the symptoms, he or she may recommend a change in diet, prescription medication, or, in severe cases, dialysis and kidney transplantation. A healthy liver plays an important role in your dog’s well-being. The liver is responsible for metabolism, detoxifying blood, filtering drugs into the bloodstream, and producing bile for the stomach. Any damage to the liver can lead to problems in all of these areas. 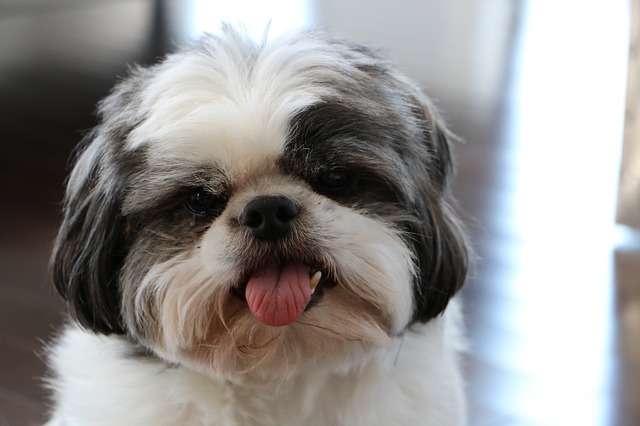 Shih Tzu can develop liver disease due to chronic hepatitis (liver inflammation). When this happens, you will notice your dog losing weight and energy, and his skin takes on a yellowish-hue (jaundice). Bring your dog to his vet for a diagnosis and treatment. If your vet determines that your dog has liver inflammation, he or she may prescribe medication to eliminate fluid buildup. Additionally, supplements may need to be introduced into your dog’s diet, as well as the restriction of sodium. If your dog’s condition is severe, he may need to rest during treatment, which may mean prolonged kennel time. Your vet can help you determine the best course of action for resting your dog. Another liver condition your Shih Tzu can develop is Canine Portacaval Shunt. Also known as Liver Shunt Disease, this is a condition that results in the inadequate processing of ammonia. In this case, blood is not filtered through the liver and is not detoxified before traveling throughout the body. Typically, your dog does not suffer symptoms from Liver Shunt Disease until six years or older. If you notice your dog exhibiting these symptoms, and he is six years or older, have his vet perform an examination and determine a proper course of treatment. As mentioned in our article on how to bathe your dog, your dog has sensitive skin! If you notice your dog is scratching a lot, has red and flaky skin, and exhibits discomfort from touch, he may have a skin condition. You may also notice the development and spreading of dark spots on the skin. Your vet can help you identify the cause of a skin condition and how to treat it. A number of causes can lead to skin irritation, most noticeably allergies and diet. Allergies. My boy, Rufus, is allergic to all things bugs! If he gets bit by a flea or a tick, he suffers from severe itchiness. He is also allergic to some medications. Last year, he was given a heavy dose of rabies vaccine and secondary flea and tick medication, which caused him to break out in hives. Needless to say, I do my best to make sure that Rufus gets no bugs on him since he cannot handle flea and tick medication very well. But, I am able to provide natural flea and tick solutions that help him since he cannot stay inside forever! Food. Some dogs are allergic to certain foods and can react by itching and breaking out in hives. Rufus is allergic to sweets. He loves them! But, sadly, his body does not tolerate foods high in fructose. If your dog is allergic to a specific food, make sure you check ingredient labels to avoid foods with the allergen in them. In general, Shih Tzu are considered a healthy breed of dog, but they can experience some health conditions. In a perfect world, they would never become ill! But, with the knowledge of these common dog health problems, you may be able to help your dog live a happy and healthy life!